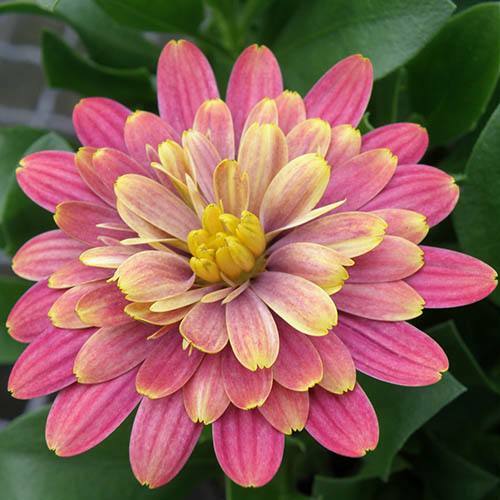 A new Osteospermum with fully double flowers and an original colour combination, Double Fun Pink is a striking magenta pink bloom with yellow highlights. Impressive and eye-catching, this daisy-flowered hardy perennial is smothered in cheerful bicoloured blooms during the summer, giving the whole plant real 'wow-factor'. Osteospermum 'Double Pink' excels in garden worthiness with an abundance of vibrant and long-lasting flowers which will fill pots and other containers with masses of unique colour as each flower on this fabulous variety is tipped with yellow, giving them a two-tone appearance. Their neat and compact habit make them ideal for bedding and the front of a border and they're a real feature when planted in pots or the centre of hanging baskets. Easy to grow and needing very little in the way of aftercare, your plants are sent as 6 x jumbo plug plants, ready to pot up and grow on. Deadhead regularly for more blooms over a longer period. Plant in reliably moist but well drained soil in a sunny position in beds, borders or containers. Deadhead regularly to keep plants in bloom for the longest time. Protect plants in containers from frosts and they will continue flowering in conservatories or in a warm greenhouse.